Global Iron Phosphate Market size was worth over USD 520 million in 2017 and will witness over 5% CAGR up to 2024. Rapid expansion in the agriculture, pharmaceutical and food & beverages sectors will propel the global iron phosphate market growth. Upsurge in the population rate resulting in the declining arable land availability, thus increasing product application scope in fertilizers. Increasing agricultural pest concerns and emerging new agrochemicals varieties will support the its penetration. Rising demand for crops along with more R&D investments in the agricultural sector will drive the business expansion. Food & beverages being the major application having usage as food additives for the longer duration preservation of food freshness, colour, texture and flavour. Growing consumer concerns regarding mineral enriched and fortified food items are the key factors fuelling product demand. Increased consumer awareness about the intake amounts for dietary supplements will boost the business growth. Rapid urbanization and increased per capita consumption expenditure will strengthen the FePO4 demand in various applications. Pharmaceuticals sector plays an important role in the industry expansion owing to the increasing consumer health concerns every year. Surging heavy investments by the global leader pharma companies such as GlaxoSmithKline, Merck, and Johnson & Johnson in the new and improved medicine processing technologies will boost the respective segment growth. Rising regulatory reforms among various regulatory authorities for the drugs improvisation with respect to efficiency and effectiveness will drive iron phosphate market demand. New and safe alternatives development in the agricultural sector such as bio-farming and organic based materials pesticides will likely to restrain the FePO4 adoption. Fluctuations in the raw material prices, periodic reforms in the government regulations, and policies regarding the environment conservation may hamper the industry growth. As per the government policies, ferric pyrophosphate & ferrous phosphate are harmful ingredients in the animal feed manufacturing process which may influence the overall product demand. Ferric pyro phosphate accounted over 50% of the overall industry share in 2017. Key applications including iron supplements for disease prevention such as anaemia, fortification in infant cereals & various drink powders, high presence of iron bioavailability will augment the FePO4 demand. 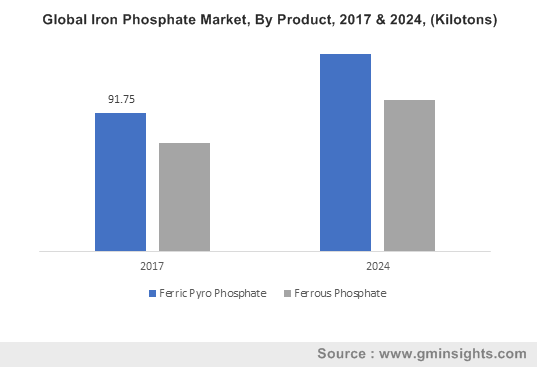 Increasing health diseases occurrences every year owing to the nutritional & vitamins deficiencies in infants, children, and adults will drive the ferric pyro phosphate market. Ferrous phosphate accounted for over 40% of the overall iron phosphate market share in 2017. Ferrous phosphate is a phosphoric acid iron salt that is used in the applications such as slug pellets and moss killers. It is naturally present in the mineral vivianite form. Increasing R&D investments to develop more effective medical compounds against growing dreadful diseases will augment the product demand. Industrial applications including iron & steel manufacturing and base coating for paints due to residential areas expansion will increase the ferrous phosphate demand. Food & beverages market will surpass 60 kilo tons consumption by 2024. Surging consumer demand and varying preferences in the food & beverages sector will stimulate the FePO4 growth. Rising health awareness regarding nutritional intake on the daily basis and increasing demand for the dietary supplements will propel the business widening. Fertilizers application will witness over 5% CAGR up to 2024. Rapid advancements particularly in the agriculture sector owing to the rise in population will propel the industry size. Key factors including escalating agricultural and fertilizers R&D investments and developing new & improved agrochemical compounds for the high-quality crop production will meet the requirements for animal feed and food sector. Thus, influencing the overall product iron phosphate market size. 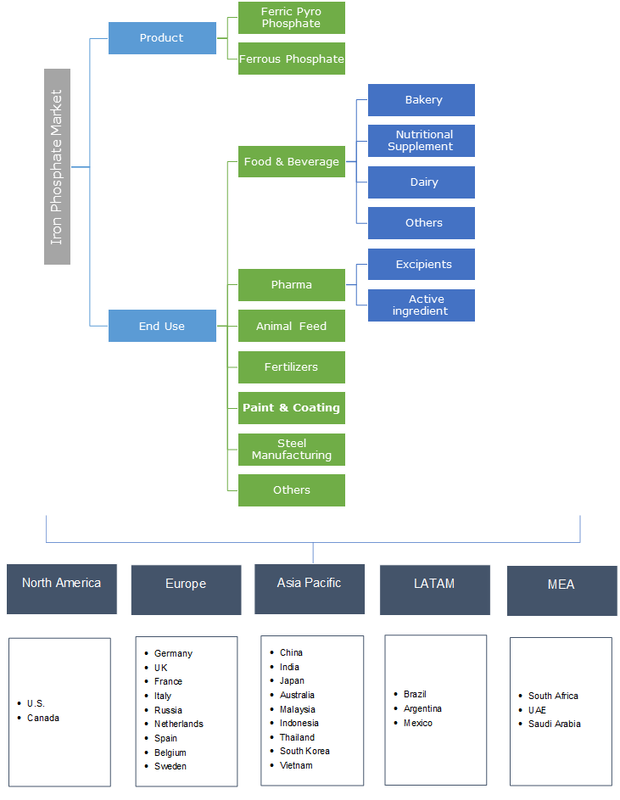 Asia Pacific accounted for more than 50% of the global iron phosphate market share in 2017. Escalation in the number of patients with iron deficiency will augment the product expansion. For instance, India is among the top nations in the world with high population rate that will result in an increased pharmacist’s presence thus boosting the industry size. As per the FICCI 2018 report on Indian Pharma sector, India will become among the top 3 pharma markets over the next 5 years owing to the low cost and at scale manufacturing capability thus resulting an increase in the FePO4 business expansion. Europe will witness a CAGR of over 4% in the forecast 2018 to 2024. Agricultural and pharmaceutical sector particularly in the countries such as Germany, UK, and France will augment the FePO4 penetration rate. Surging food & beverage segment including various bakery products such as breads, cakes, fresh creams, flavouring agents and sweeteners among the young population at a rapid pace will exhibit an amplification in the product demand. Thus, making an influence on the overall industry size. Global iron phosphate market share is fragmented due to the large regional and international players. Merck, American Elements, Jost Chemical Co., and ILVE Chemicals are among the key players. Other industrial participants include Spectrum Laboratory Products, Imperial Chem Corporation, Crest Industrial Chemicals, Hefei Asialon Chemical Co. Ltd., Aarvee Chemicals, and Charkit Chemical Corporation. Manufacturers are expected to invest in capacity expansion and adoption of several growth strategies including mergers & acquisitions, long term supply contracts with raw material supplier and distributors to improve their industry foothold. Iron phosphate is referred as ferric phosphate which is an inorganic compound with the formula FePO4. Key materials related to the compound are available including four FePO4 polymorphs and two dihydrate FePO4 (H2O)2 polymorphs. It is used in the organic farming and steel & metal manufacturing processes owing to its key feature such as bonding with metal surface that prevents its further oxidation. Its coatings are primarily used in the powder coating process and base coatings for several paints owing to its key properties including rustproofing and high adhesion to the steel or iron substrate. It can be used as an intercalation electrode form in the lithium-ion battery. Key features including thermal stability and good cyclability aids to its usage as an ideal electrode material for the electric vehicles batteries. Shifting consumer preference for the electric vehicles with more advantages than the fossil fuel vehicles will escalate the FePO4 demand and hence propelling its overall business expansion.